← Ask a WISE Teacher! Just like lions are the top predators of the savanna, lionfish (Pterois volitans) have quickly become the top of the food chain in the Atlantic Ocean. Native to the Indo-Pacific Ocean, these venomous fish were first found in the Atlantic in the 1980’s and were believed to be originally released by exotic fish aquarium owners off the coast of Florida and then carried northeast to North Carolina and Bermuda by the warm gulf stream current as eggs or larvae. Here, the lionfish are able to eat just about anything smaller than them including fish, shrimp, crabs and octopus. Until recently they had no natural predator, but people have begun to hunt lionfish for food- after removing the venomous spines they make a tasty dish. As seen in an episode of the “Octonauts and the Lionfish” cartoon, this fish is also highly aggressive. The Octonauts is a British children’s show on BBC that features a crew of eight underwater adventurers, who live in the Octopod, an undersea base. These adventurous critters include a polar bear, tabby cat, penguin, octopus, sea otter, rabbit, dog, and vegimals (half-vegetable and half-animal) that talk, walk, and explore just like humans. In this episode, they find a lionfish duo, Lilly and Louie, while monitoring a coral reef in the Atlantic Ocean. The preferred habitat of lionfish are coral reefs and shipwrecks, and just like Lilly and Louie, they work together to hunt in packs and herd their fish prey. When discovered, the pair of lionfish was indulging in a wide assortment of unsuspecting undersea critters that are not accustomed to looking out for the lionfish as a predator. Another advantage that the lionfish has is that it uses a suction mechanism to eat its prey in “just one fast gulp,” as the lionfish in Octonauts kept repeating. This television show is a great way to educate small children about invasive species, food webs and conservation while they watch! Another recent appearance of the lionfish on television was on “Ocean Mysteries” with host Jeff Corwin in the episode, The Hunt for Lionfish (watch the episode trailer below, or follow this link for the full episode). “With no natural predators to stop them, an endless supply of fish to feed on and armed with those venomous spines, they are literally eating their way across the Atlantic,” explained Jeff Corwin about lionfish as he prepared to dive with National Oceanic and Atmospheric Administration (NOAA) divers to investigate the invasive lionfish off the coast of Georgia. NOAA researchers emphasized that one reason the lionfish is such a successful invasive species is because a mature female can produce up to 30,00 eggs almost every four days! Not only were multiple lionfish found within depths that divers can reach, but they were also found at over 400 ft deep off the coast of Curaçao with the use of a high-tech submarine known as a man submersible. Finding lionfish at these depths indicates that they are extremely adaptive and are able to survive at ocean depths much deeper than previously expected, giving them the ability to invade a variety of marine environments. As the submarine crew spears the lionfish at this depth, Corwin reminds viewers that even though this is a beautiful living creature, it is making a largely harmful impact on its environment and must be removed to preserve the health of the ecosystem. At shallower depths, the lionfish has been found to have wiped out up to 95 percent of native fish in some parts of the Atlantic Ocean, but a recent Oregon State University and Simon Fraser University study found that there is still hope. Dr. Stephanie Green and her team used ecological modeling to determine exactly what percentage of lionfish to hunt in a habitat to revive the native fish populations. 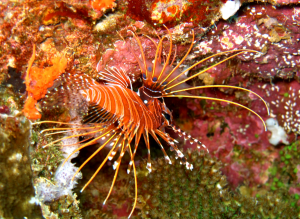 Contrary to many invasive species situations, this research shows that eradication of the lionfish is not necessary to allow native fish to thrive in “safe havens, small pockets of reef where lionfish numbers are kept low” and then spread to other reefs. On the reefs where lionfish numbers were kept below a density (or biomass) threshold in the model, native prey fish increased by 50-70 percent. 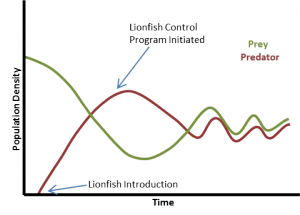 This predator-prey population dynamic graph (Figure 2) displaying a model relationship between the fish that lionfish prey on and the lionfish (predator). It shows that the two populations’ numbers are dependent on each other and that the lionfish introduction caused a drastic decrease in the prey population. 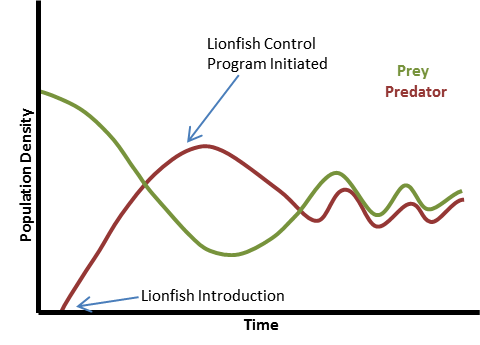 This model is based off of the research conducted by Dr. Green and her partners and predicts that after human intervention (removal of lionfish to a certain biomass threshold), the lionfish population would be expected to decrease and cause the prey population to increase soon after, allowing the two populations to fluctuate with each other and eventually reach a sort of equilibrium. If population numbers are maintained at a healthy ecological level, the lionfish could be overall beneficial in regards to scientific study. The venomous spines on all sides of the lionfish’s body are what protect it from many potential predators, but this harmful armor has the potential to be useful for humans as well as the lionfish. The Animal Planet presents a clip from Wild Recon: Lionfish Venom in which Donald Schultz captures a lionfish off the coast of Belize to take a venom sample from its deadly spines. 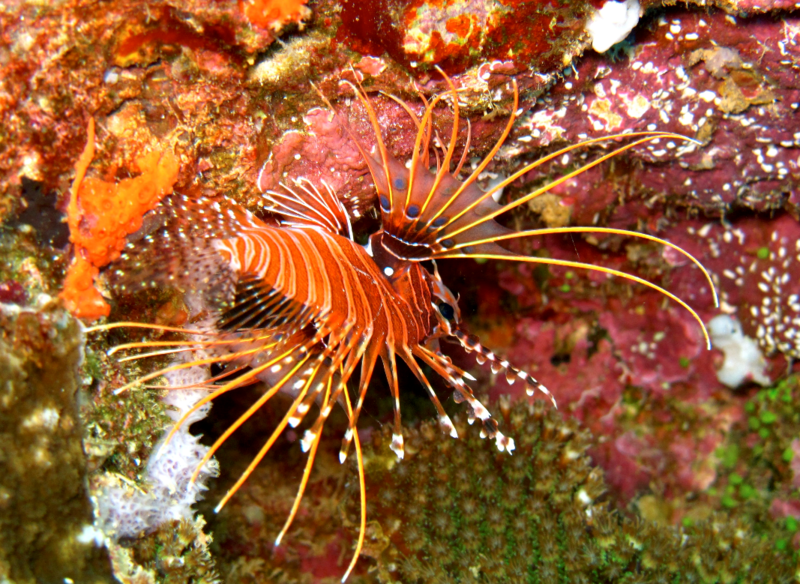 Schultz reports that through further research lionfish venom could be found to be a building block for heart medication. After its spine extraction, this lionfish will go into captivity and kept for educational purposes. This alternative to hunting keeps the critter alive, enables for the public to learn about this issue, and prevents it from further harming the marine ecosystem off Belize. After a visit to Bermuda in 2015, the iRobot chief executive Colin Angle founded Robots in Service of the Environment (RISE) to fight growing populations of “Darwin’s nightmare,” the lionfish. Through a partnership with marine ecologists, RISE has prototyped robots that electroshock lionfish using the conductivity of seawater and captures them for scientific research and harvesting purposes. Lionfish have no natural predator in these waters, meaning they will not flee, like native fish, when approached by the zapper model making this arguably the most humane option at this point. To learn more about the lionfish invasion, teachers can find curriculum to educate their students, even from the West Coast. The Florida Sea Grant was part of the team that developed lesson activities for their region, including one called Lionfish… Could They Invade Our Waters?!? !, which is part of the teacher’s guide, Intruders in Paradise: Invasive Species in Florida. Through education and selective hunting, the war on lionfish is one that still could be won! I am a senior studying Environmental Science and Zoology at OSU. I started at Oregon Sea Grant in summer 2013 as a PROMISE Intern and I was then offered to continue to help with the WISE program and other projects. This entry was posted in Feature Stories, Resources and tagged Atlantic, classroom, ecovillain, education, florida, invasive species, lionfish, native, ocean, OSG_WISE, outreach, reef, research, resource, students, teachers, Watershed and Invasive Species Education, WISE. Bookmark the permalink.